A fresh approach to acoustic music with roots that date as far back as mountain music can reach, The Biscuit Burners offer their Fiery Mountain Music with innovative instrumentation, resplendent harmonies, and captivating original material. Their unique yet familiar material pulls strong from their respect of traditional mountain music, their love of bluegrass and classic country, and their appreciation of music from the far corners of the world. In September of 2005, the band released their second album, A Mountain Apart. With this release, The Biscuit Burners presented an album full of energy, passion, and originality. 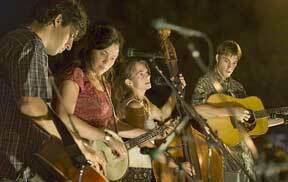 A Mountain Apart is a testament to the bands devotion and dedication to their Fiery Mountain sound and was in the top 20 of the Roots Music Report National bluegrass airplay chart for the first 5 months of its release. The result is a brand of bluegrass as clean and smooth as a mountain stream. - American Songwriter, Nov / Dec 2005. Not only do The Biscuit Burners take their Fiery Mountain Music to Americas finest venues, but they also take their knowledge and passion for music to schools across America. Their presentations range from history lessons to instructional lessons and are customized from students in kindergarten to high school. From Oregon to Virginia, the Biscuit Burners have introduced and inspired Americas youth in hopes to preserve this music that they have dedicated their lives to.